I have been traveling much more often lately. The flights are long and books (while amazing) are heavy, so I've been playing my Nintendo 3DS XL. While it's not the newest with its fancy C-stick, it does more than alright. What have I been playing on it? Legend of Zelda: Majora's Mask! Like so many others, I played the game as a kid on the N64. An adventure to get the bad guy in a weird place with time constraints was a bit confusing for my smaller self but the dungeons and story elements were fun and the moon was squee-inducingly scary. I played again as an adult on the GameCube (all tricked out to work with my laptop with no extra monitor, yay!). There was a lot more depth than I remembered from the early playthrough, which I attributed to growing up (growing into the game sounds right). The characters new and old were fascinating and had their own lives, each area was more significant in its symbolism; I ate up the fan theories about this being Link's trip through purgatory after death. After 100% completion, I put it down for a while in favor of other games at the time. With the release of the 3DS version, my enthusiasm was piqued once again. After all, what better way to pass my time in the airplane or airport (besides Animal Crossing: New Leaf)? Suffice it to say, I picked up a copy and have not regretted it! While this replay is slow, it has been determined and I've been doing my best to play sans guide. A few things have changed between the games such as the bank's location, Bomber hiding spots, stray fairy locations, etc, but the most notable difference has been the graphics remastering! The walls now have etchings and posters, creatures are a little less polygonal, even the moon's teeth are 3D. It's so well done it feels like a new game! Something that I've found odd in spite of the improvements are the boss battles. In the N64 version, it was mostly hack and slash, now this hack and slash strategy is used for exposing a giant eye that is the boss's actual weak spot. I'm really not very certain on how I feel about it, but it does cause a lot of stop and go in the fights which I'm not overly fond of. 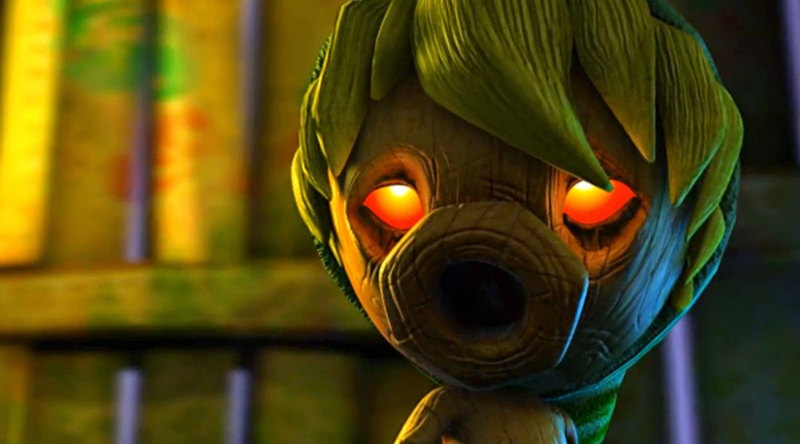 Overal though, I'm very happy to be playing Majora's Mask again, and amazed at the face lift it has received!